The holiday season has arrived and we are ready to bring in the New Year in style. Since we didn’t want to party alone we have created a list of fun ideas to wrap up this year in the best way possible. Trust us, the following tips and tricks are not only simple and budget-friendly but, all of these do-it-yourself ideas will leave your party-goers so happy they chose to bring in the new year with you and your gang. Try one or all of the following suggestions to bring your New Years bash to the next level. While there are so many fun ways to display your treats and cocktails, if you follow us on Pinterest you would know that we believe that a trendy bar cart makes a versatile choice not just for NYE but for so many other occasions as well. And if our Bar Cart Pinterest Board has not yet convinced you that you need one for your NYE bash perhaps this idea will. 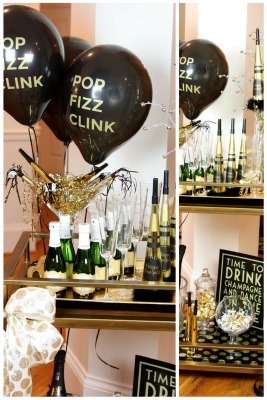 Here, Courtney Whitmore does a great job giving us the bar cart breakdown on how to style your cart accordingly, but what caught our eye was her fun balloons! And while we couldn’t agree more we also know that you can very easily recreate this style with any balloons you like and a set of metallic Wine Glass Writers. What’s even better about our method is now you can write any crazy message you like on your balloons. Don’t like your handwriting? Grab some stencils and you’re good to go! We already know that you love wine tasting parties, but have you ever been to a champagne tasting party? The ‘Inspired By This’ Girls grabbed our attention when they suggested this perfect alternative for a New Year’s Eve party! “What’s more fitting, than ringing in the new year with (various types of) champagne and good friends,” they say. “Not only is this champagne tasting a fun & creative party but it’s beautiful too.” And you can see exactly what they mean by that when you follow all their tips to host the perfect NYE champagne tasting here. Champagne Is Great But What About Cocktails? And while we agree, sometimes you just really want a cocktail, right? Listen, we get it - as you can see here, we are cocktail recipe hoarders. So naturally Jessica’s list of champagne cocktails had to be included in this list. Trust us these are going to be good, so don’t lose your drink or someone else will be sure to finish it for you. 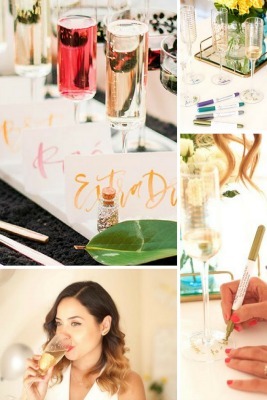 Label your drink with a Wine Glass Writer and don’t forget to write on the base of your champagne flute or above the pour line when serving chilled drinks! Where would we be without resolutions on New Years Eve. 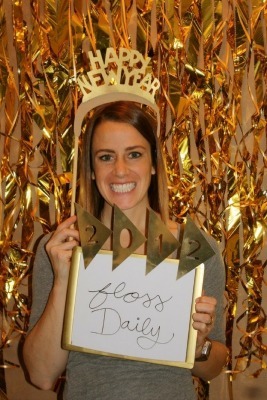 We completely love this idea we found on the 'One Little Minute Blog' for a New Years Resolution booth. Create your own stylish photo prop with a cute picture frame and black paper. 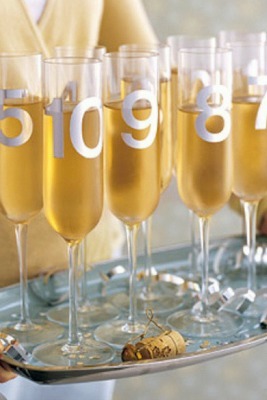 Have your guests write their resolution on the glass and take a photo. (You can easily clean the glass between takes with a Windex wipe) Now there will be photographic evidence when you aren't sticking to your resolutions! While she suggests picking up some self-stick numbers from an office supply store you already know that this is the perfect task for our Wine Glass Writers. 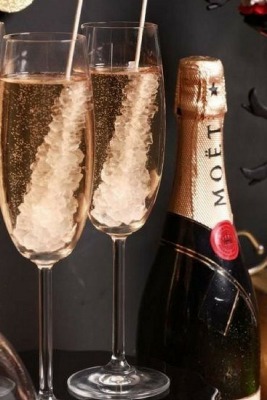 Keep in mind you’ll want to write on the base of your champagne flute or above the pour line for your chilled beverage. Now it's your turn - tell us your favorite NYE tips and tricks so we can try them too. Cheers from all the gals at Wine Glass Writer & Happy New Year!